Of all the vehicles that parade by my house on busy Harrison Street, this one stood out as distinctly different. Two big rollout bins on a trailer being pulled by a bicyclist. Having long imagined a world in which bicycles are adapted to fill varied transport needs, I decided to head off in pursuit to find out where this one-man sustainable parade was headed. He was moving along at a good clip, but I caught up with him on Valley Road, and learned that the vehicle is owned by the Whole Earth Center grocery store on Nassau Street. Every year, staff vote on what to buy with the accumulated loose change found on the floors during cleanup. Last year, they bought this bike and trailer. It often carries their food up to the farmers market in good weather, but on this particular day, it hauled a week's worth of salvaged plastic packaging to the municipality for recycling. At the same location (corner of Valley Road and Witherspoon Street), the township makes yardwaste bags available for residents, and you may be able to recycle your electronics there as well. along with the text below, borrowed from a public library newsletter, should tell the whole story of the stealthy shuttle's current schedule. "Starting at the Suzanne Patterson Center at 9:30 and 10:30 a.m. and 12:30, 1:30 and 2:30 p.m. on Mondays, Wednesdays and Saturdays, the free jitney will stop at Elm Court, Palmer Square, the library, Princeton Shopping Center, Community Park Pool, Princeton Community Village and many popular intersections throughout Princeton. Thanks to Princeton Borough, Princeton Township, Princeton University and the Community Transportation Coordination Initiative for extending this service on a trial basis." It really takes conscious effort to change one's habits and take advantage of this service, which is not exactly advertising its existence in a big way. This photo was taken back in February, at the Dinky station, where I searched in vain for a posted schedule. You're looking at the only downtown location I know of where recycling containers can be found on the streets, at Hinds Plaza next to the public library. They are expensive stainless steel models, but their design could be improved to better distinguish them from the trash containers they are, or should be, paired with. 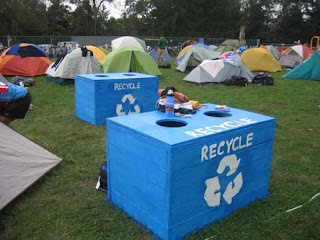 I've informally explored and documented recycling receptacle designs--which vary from effective to self-defeating--in Princeton and elsewhere, many of which are posted at www.recyclingcontainers.blogspot.com. A post about how the Hinds Plaza containers could be retrofitted to improve their function can be found here. What is a tent village doing in the YMCA field? My daughter wanted to know. We stopped to inquire, and learned that Climate Ride was coming through town. Bicyclists, including a family with an eight year old, rode yesterday from New York City to Princeton, on their way to Washington, D.C. via Philadelphia. The purpose of the ride is to draw attention to the need to confront the increasing impact of climate change on spaceship earth. 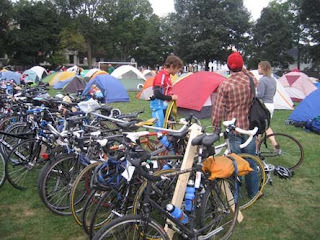 They have a website, climateride.org, that includes live feeds of the five day journey. Long before there were cars, Princeton served just as it is now for the bikers, as a rest stop halfway between NY and Philadelphia.